That looks real nice... Whats the deal with "SE" and "GT" Tiburon calipers? 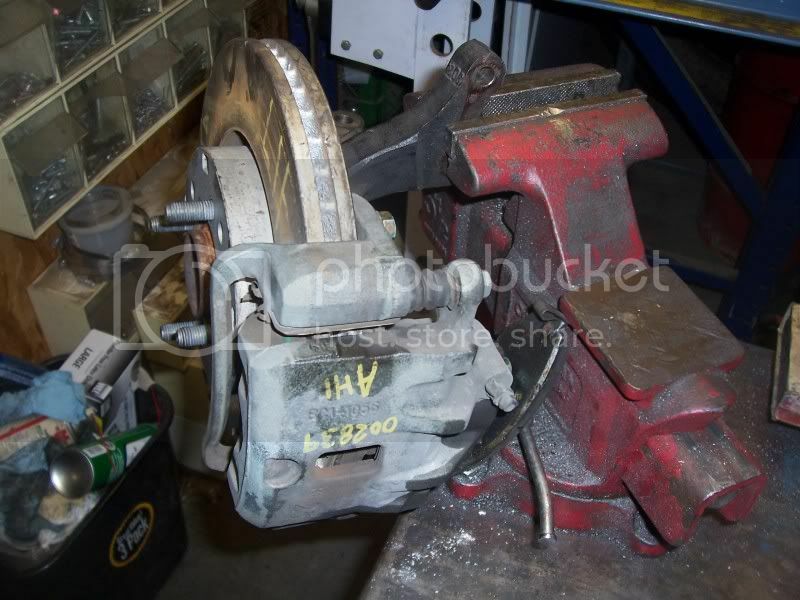 I looked into grabbing calipers today but the recycler wanted to know if I wanted the earlier Tib or later Tib calipers, think the years were 03-05, maybe 06 and 05/06 an up. So what is what? I think they're the same from 03-06 and 07-08. Any should work. The SE has lightweight calipers. Lightweight calipers, nice! Is SE available for both year groups? What is the caliper centre to centre mounting distance on the knuckle? Im currently doing my Fronts as well, Im using Granduer Parts, 276mm disc, twin piston and redrilled rotors. Yes, the SE package might even be better on the 07+. I will grab a measurement later but what knuckle are you wanting the dimensions on, Accent or Elantra? Thanks for the info Floyd, big question is how will the brakes react using the Accent brake system? It should be fine as long as the calipers don't require too much volume. I doubt these will. You'll probably need more pedal travel, but be able to modulate them better. 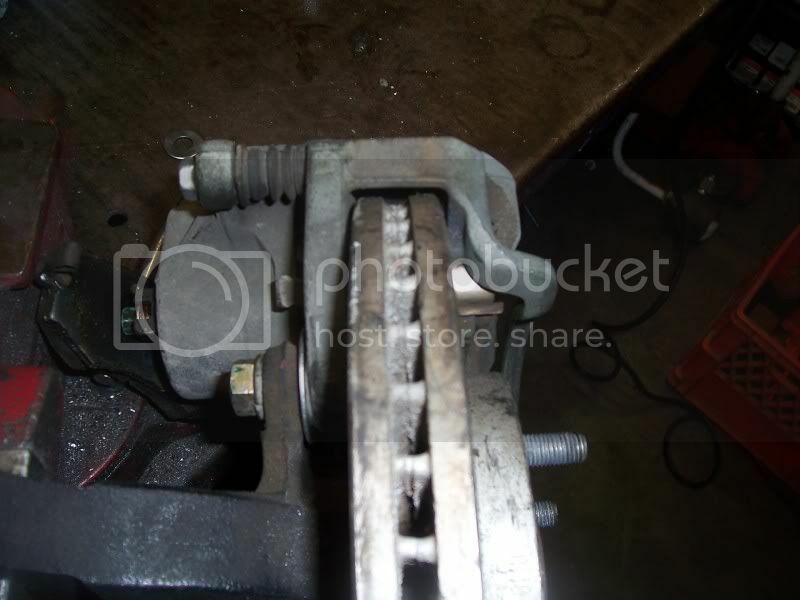 I was after the caliper bolt holes centre to centre on the elantra knuckle. Sonata Proportioning valve - Granduer has 2 port where as you need a 4 port valve. Im just in the process of perfecting my Rear disc conversion, The kit will soon be for sale if anyone is interested. 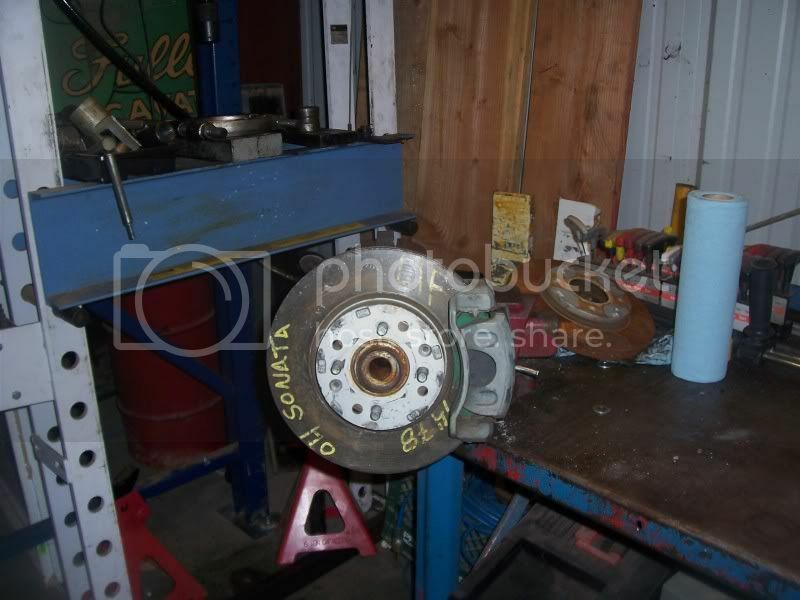 Ok I have mated the following: 99 Elantra Knuckle, 02 Accent hub, 04 Tiburon Caliper (non SE), 04 Sonata rotor redrilled to 4x100 and for the bearing either the Elantra or Accent will work, cause there the same. Tomorrow I will get a deep comparison between the 03 Elantra knuckle and 99 Elantra knuckle but i believe they share the same alignment specs, then compare it to the Accent to see what the changes will be. Toe will be out for sure, camber may be out, as for caster it looks close... anyways more on that tomorrow. I did have to install a thin washer to center the caliper assembly over the rotor. You can see it in the pic sitting between the caliper and caliper mount. This is do to the Accent hub face sitting 1mm past were the Elantra hub face would have been. 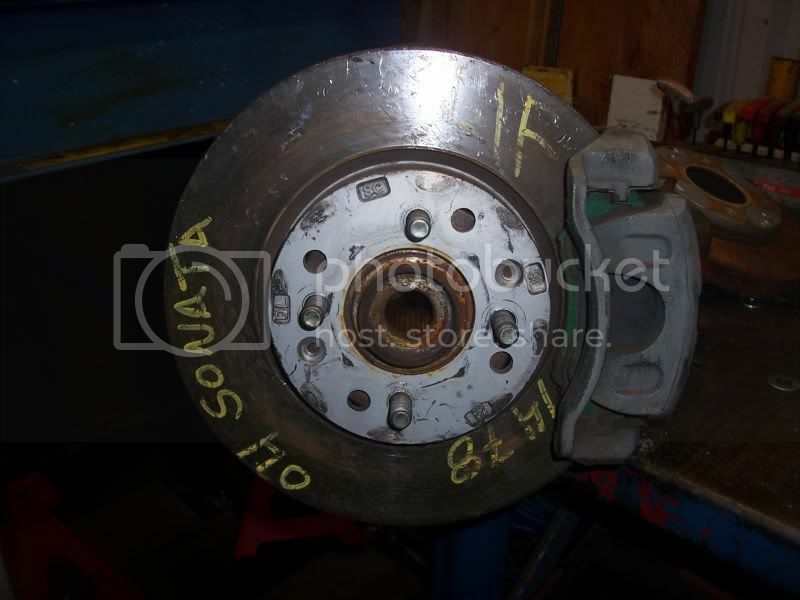 I have alot of parts to collect but im gunna go with cross drilled and slotted rotors front and back to save some weight, them sonata rotors are freakin heavy. I am gunna hunt down these Tiburon SE lightweight calipers for more weight saving. New bearings all the way around, stainless steal braided lines all the way around and new axles for both sides. bit after i took off the 2 lug nuts that were holding it in place. Most men wish they could have 2 more inches, me... im bouts ta do it! Ryan, I will get you those numbers tomorrow.